Tragedy or Comedy: You Pick. When my fifteen year old son and I are crossing a busy highway ramp to climb over guard rails that come up to my crotch and skitter down a fire-ant ridden trail that runs along a steep embankment much like a goat trail, there is nothing to do but laugh. I might get hit by a car. Somebody might see my underwear. I might get devoured by an army of voracious ants. Slipping and falling is a real possibility (and reality–we’ve fallen each time). But the ridiculousness of a country that builds bus stops along the main highway with no pedestrian access either has to be tragic or hilarious. In Shakespeare’s tragedies all of the main characters die. They are genuinely tragic. His comedies, however, defy our definition of comedy. They are not necessarily funny, but rather focus more on plot than character, so one can better stomach any misfortune. There have been many moments when my first week in Costa Rica has certainly felt tragic and full of despair, but I have decided to adopt Shakespeare’s definitions of tragedy and comedy and infuse it with my own, which requires laughter. I laughed when thunder began to roll over our heads two miles from home and the gutters started to fill up with the downpour and our Uber canceled on us. I laughed when we ordered “dos helados: chocolate & vanailla,” hoping to get the ice cream twist that everybody else had, but getting one chocolate and one vanilla instead. I laughed when we sat through two hours at the bank, staring at numbers on a screen. When an old man driving an 80s Nissan pulled over at 6 am yelling at us in Spanish and all I could understand was, “Vamos!” I opened the back door and climbed in and laughed. Because either I was about to live a Central American nightmare where my body would be found in a ditch with a slit throat or I was getting a ride to the bus stop. Tragedy vs. comedy. At the farmer’s market I filled up my basket with a variety of rice for dinners. One was a colorful wild rice and one was something that looked like a couscous variety. When I went to pay, my principal, who has been helping me navigate the land a bit, asked me what I was going to do with birdseed. “Birdseed?” I asked her. She pointed to the bags of rice and couscous. “Those are for parrots and canaries,” she told me. “See? ‘Laro’ and ‘canario.’” As I put the birdseed back, I laughed. Because who keeps birdseed next to the lentils and garbanzo beans? And what would it have actually tasted like with a little cilantro? Elliot’s belt broke this week and he is in need of some khakis, so we found a department store to get him suited up. But after walking the entire store, we could not find any dressing rooms for him to use. Exhausted from school, from navigating, and from the language, I did not have the energy to find out how to ask for help, so instead we went to the second floor in the furnishings department and he hid behind a row of white dishes and dropped trou right there while I kept watch and laughed. Fortunately, we didn’t go to jail for shoplifting. The hardest I’ve laughed since we have arrived has been sitting on my principal’s patio while she went inside to make us lunch. Her sweet 83 year old mother with dementia insisted on telling us long stories in Spanish. 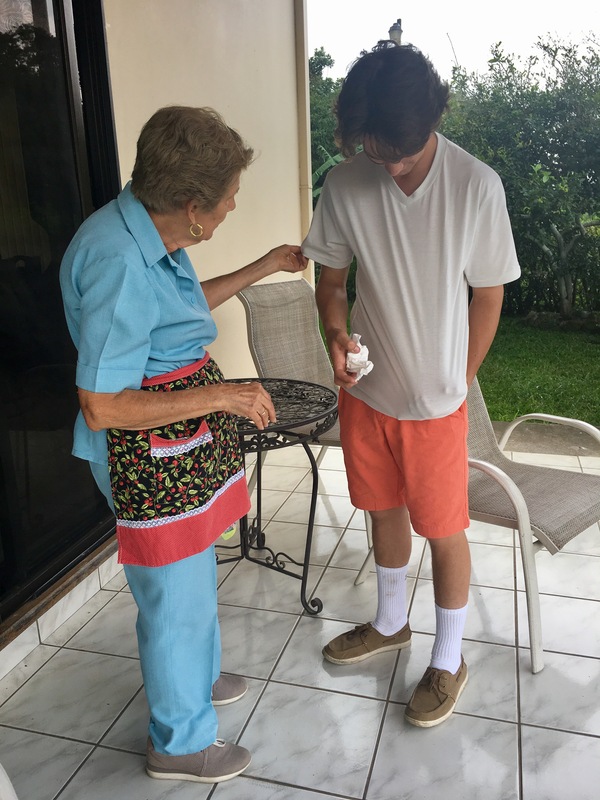 We would remind the older woman that we didn’t speak Spanish and didn’t understand everything, but she would forget and start over, telling us long, detailed stories, bursting out into laughter. She would ask us questions and I would answer “Si” or “No” or “Uno.” And she would smile and laugh and keep talking. At one point I accidentally told her I have three brothers and that Elliot was the youngest. Elliot told me I should correct myself, but it didn’t matter because a few minutes later she asked, “Tienes hermanos? Cuantos?” and I changed my answer. We think she told us about somebody who died. We think we told her that I work with her daughter. She insisted on getting a wet paper towel and wiping down Elliot after he petted the dog. But for thirty minutes, we made stuff up and laughed until we were crying, choosing between the tragedy and the hilarity. I am laughing because I signed up to be the Student Council Advisor and sat through a bilingual meeting where all of the important things about it were said in Spanish. 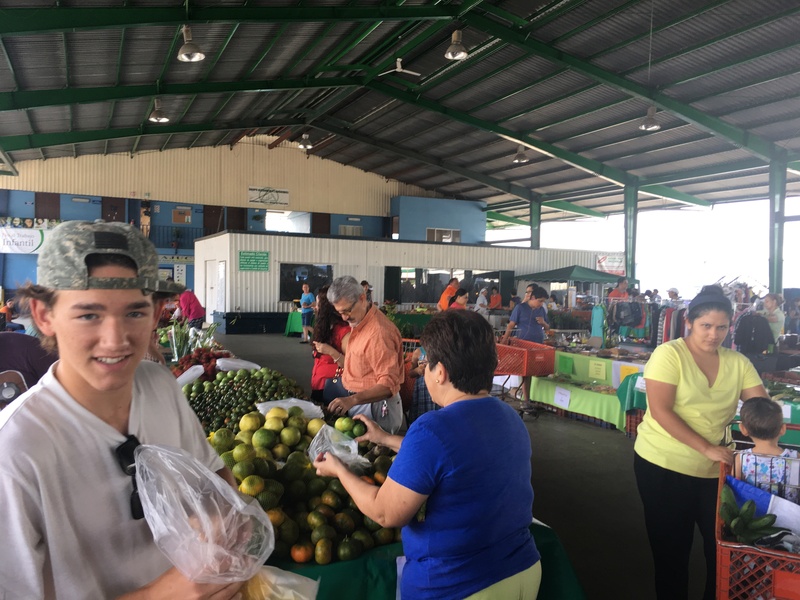 Because we have to move to an apartment closer to school and they are all unfurnished–and Costa Ricans consider stoves and refrigerators furniture. I am laughing because I killed a two-inch cockroach after it scrambled past my head. I am laughing because after one week of being here, I have to pack up all of our belongings and hope a cab will come get us at 5:30 am tomorrow morning so that we can move to a bare apartment, owning nothing but our clothes and a little food, after school. Laughter is permission to let go. It offers us perspective and allows us to accept that there are situations of which we no longer control. A reminder of our vulnerability and acceptance of our helplessness, it is acknowledgement that we are alive and full of pain. Laughter is what ties our most precious moments together. It brings us relief and propels us forward. Without it, we would just cry. Without it, we could certainly be living a tragedy. Those ants are no joke. I got attacked by them once. Should it happen, Gold Bond anti-itch cream is a life-saver. Wish I could hang out with you and translate, but for now, Gold Bond. I jjst really loved this one. I feel for you! I have thought so often how the refugees must feel when they come here. I enjoyed working with them, but frustrating sometimes cause they couldn’t speak our language. I choose to laugh with you, cause there is nothing else to do. I hope you can at least get 2 chairs. Love you two! OMG you are killing me!!! I no joje choked with laughter at the thought of you eating bird seed with cilantro!!! I love you guys! Adopt me!!! With each piece you write; I become more and more in awe. Previous Previous post: Don’t Bank on It.